Traveling through Europe is a dream for many travelers around the world – and while getting there from another continent is quite easy by plane there are several options to get around once you are in Europe. Renting a car, taking flights, hitchhiking or buses are all valid options (and there are still plenty I didn’t even mention!) that have their right to exist. However, during September 2018 I traveled through Europe by public transportation, mostly trains, with the Interrail Global Pass. Already when I was a teenager I was thinking about doing an Interrail trip through Europe, yet, I didn’t do it. Eventually, after some more years have passed, I gave it a try and will tell you about my experiences during my month traveling with the Interrail Global Pass. *Disclaimer: As a part of a collaboration Interrail provided me the Interrail Global Pass (1st class) ticket. All opinions are my own. Interrail is basically a European railway ticket, which allows unlimited rail travel in and between all of the 30 participating countries. 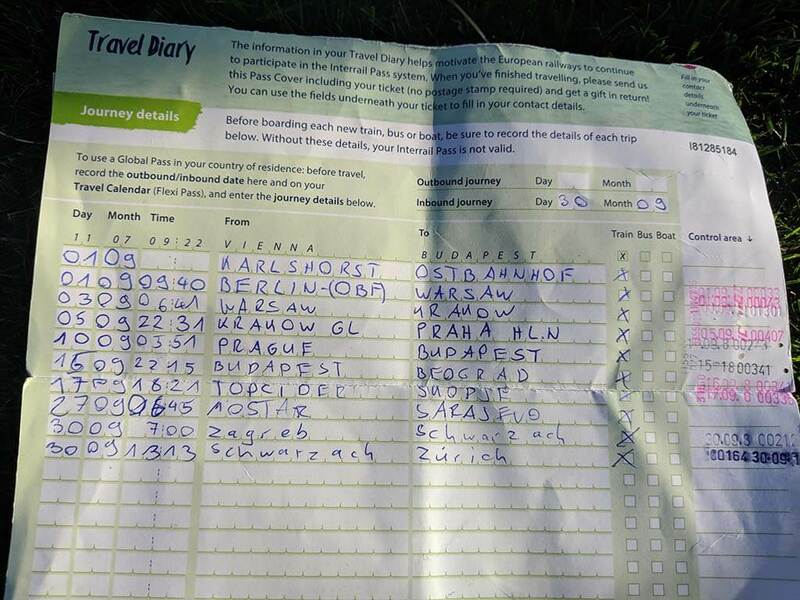 The ticket includes major tourist hotspots like Paris (France), Rome (Italy), the Swiss Alps (Switzerland) or London (UK) but also less touristic countries like in the Balkans or Eastern Europe. There are also some buses and even ferries that you can use with your ticket. You can find more information about Interrail or the Interrail Global Pass that I used on their website. If you were looking for information about Eurail, don’t be confused – it’s the same thing, just for residents outside of Europe, while Interrail is for residents of Europe. The services are the same though. My journey originally started in Berlin, from where I took my first train to Warsaw, the capital of Poland. To my surprise, this was the least luxurious train during my time in Eastern Europe. 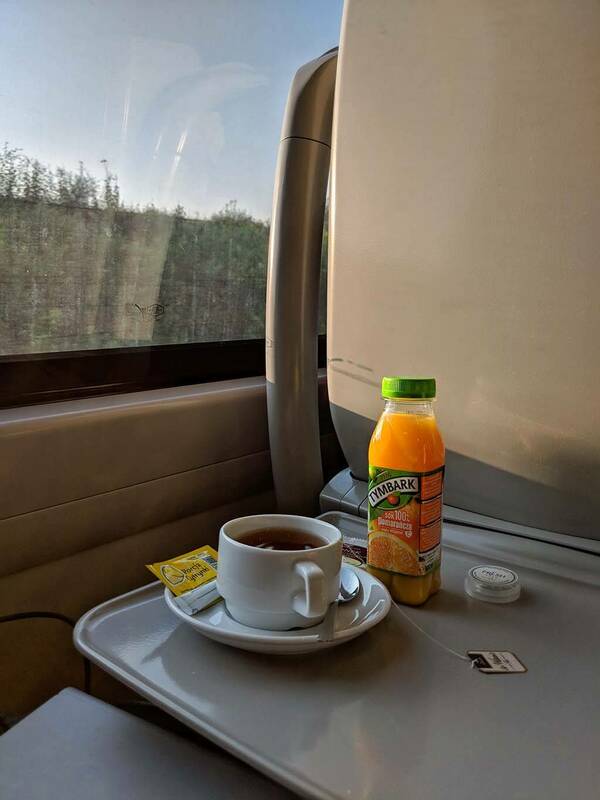 After that, I took a train to Krakow, where even breakfast and some drinks were included in my ticket (first class) and served during the journey. 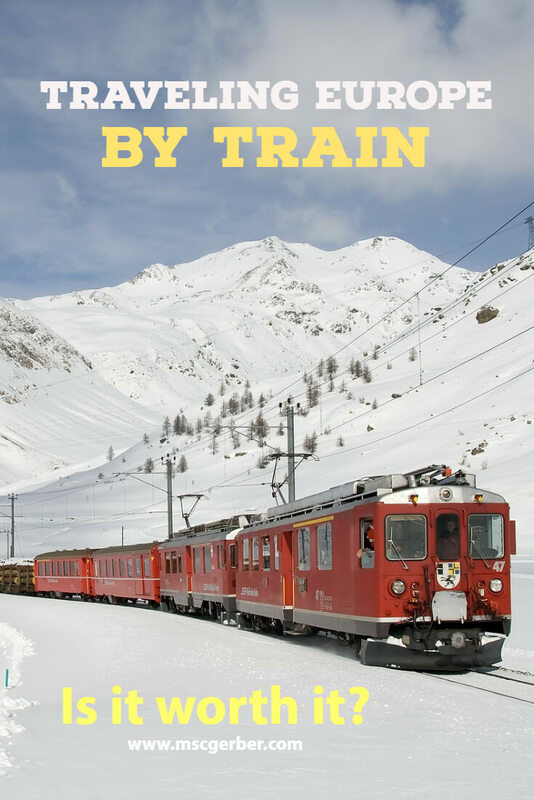 I was really happy with the quality of trains in general – so traveling by train in Eastern Europe is certainly a good option. What I was really looking forward were the night trains – because they save time (you travel while sleeping) and money (you save the costs of a hotel/hostel for the night). While the night train from Krakow to Prague was super comfy and spacious – I should make some other experiences in the Balkans later on my trip. But I will tell you more about that later! Depending on your ticket and the money you want to spend, you can usually book everything from a regular seat to a single room with a bed on night trains. But it’s always better to check the availability beforehand. 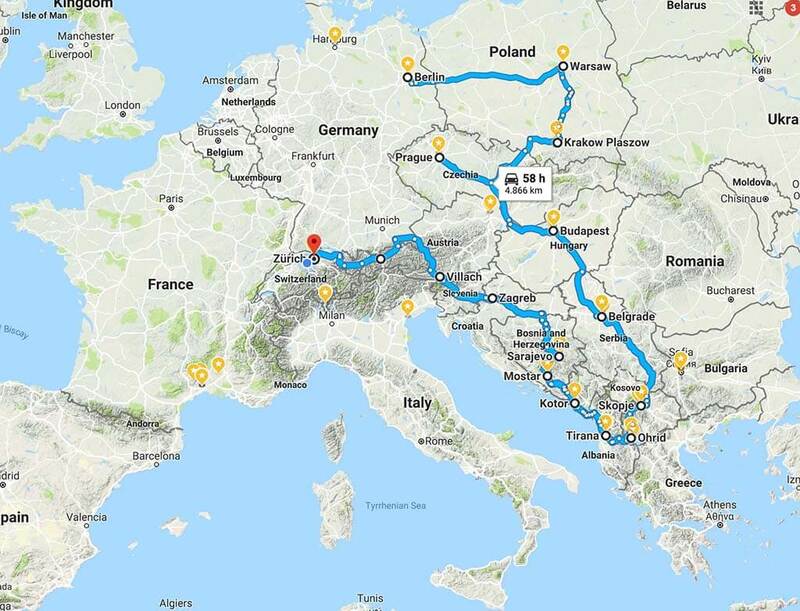 On my trip from Krakow to Prague, I stayed in a 2-bed sleeper with one other person. Once I arrived in Prague I originally wanted to book another night train to Budapest – which was unfortunately not possible, as everything was booked out already. If you are traveling on popular routes (especially in night trains) you should make reservations early in advance. Luckily that was usually not the case in Eastern Europe and the Balkans. Eventually, I reserved a regular train from Prague to Budapest, which left early in the morning and arrived shortly after noon. Luckily, there are always different options to choose from. After Budapest, the real train adventure was about to start. 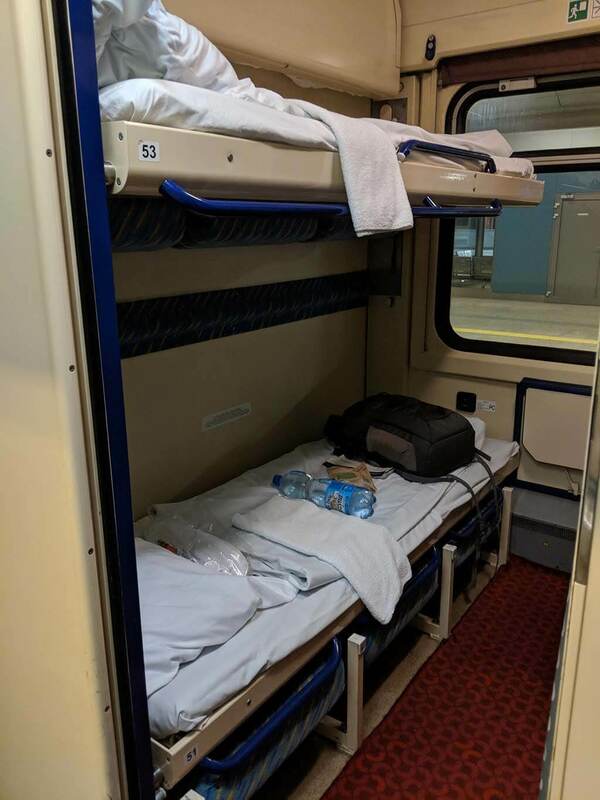 I made a reservation for a sleeper (2-bed room) for the night train to Belgrade, the capital of Serbia. On the internet, I read many bad reviews about this particular connection – as there were some unpleasant incidents in the past. However, these problems are under control now, thanks to a higher presence of police. Like in my previous night trains the bed was quite comfy and I started to sleep pretty fast. Unfortunately, the area of the European Union ends here, as Serbia is not part of the union yet. That means that you will have to show your passport in the middle of the night. But that’s the same for every way of transport! Anyway, quite tired I made it to Belgrade, where I immediately made my next reservation: Another night train, this time to Skopje, which is located in Macedonia. On the day of the departure, I made it to the train station “Topcider”, which looked quite special and really old. 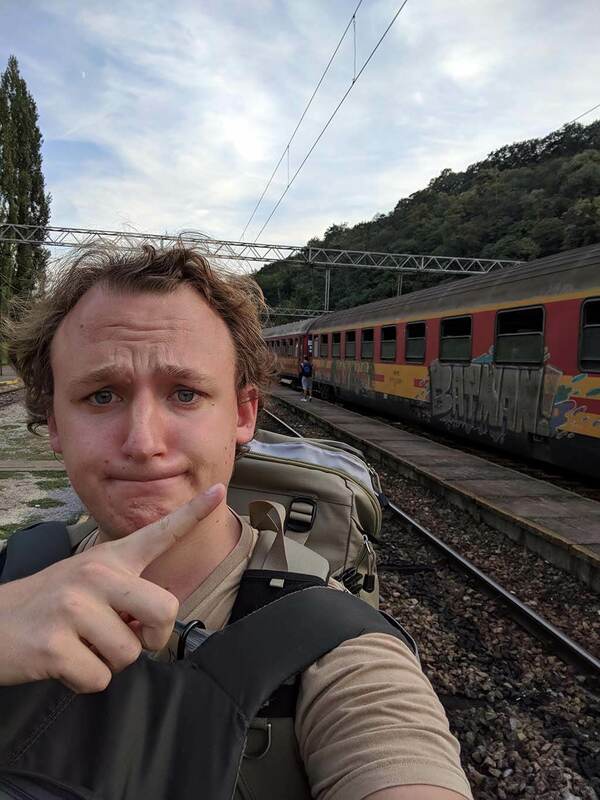 I was not even sure I’m at a train station until I saw some other backpackers and talked to them. (They were as puzzled as me). This train (which continues to Thessaloniki), only offers 6-bed couchettes – which means less space and more people in one room. The train ride itself was extremely slow – which made it boring but also interesting. I will not forget the moment I looked out of the window at night, in a totally remote area of Serbia, and saw a sky full of stars. Once I was in Macedonia I had to change my way of transportation mainly to buses (I will skip that part for this post), at least until I was in Mostar in Bosnia. From there I was able to take a really modern train to Sarajevo. I was surprised by the magnificent views during this ride – which were as beautiful as the famous train rides in Switzerland. I’m sure that this area will become quite popular in the future. As Bosnia and Croatia are having some problems – there was, unfortunately, no real train connection from Sarajevo to Zagreb afterward, which led to another long bus ride. Finally, I took my last train from Zagreb to Zurich (via Austria) – which was also the end of my one month trip through Europe with the Interrail Global Pass. Of course, Interrail is not the perfect solution for every kind of traveling, but I can say that it’s a great option to travel around Europe, especially if you want to see many different places in a short time and meet other travelers during your adventure. I would recommend Interrail / Eurail to everybody, and even more if it’s your first time exploring Europe. You can get a short glimpse of various places – and take some more time on your next trip – focusing more on the places you liked the most. *Contains affiliate links. If buying one of the products I will receive parts of the sale price. There are no additional costs for you. One problem when traveling around Europe by train (but also other ways of traveling) is to stay connected during the whole trip, as you will be in many different countries. During my trip with Interrail, I used Skyroam Solis, which was the perfect solution for this challenge. 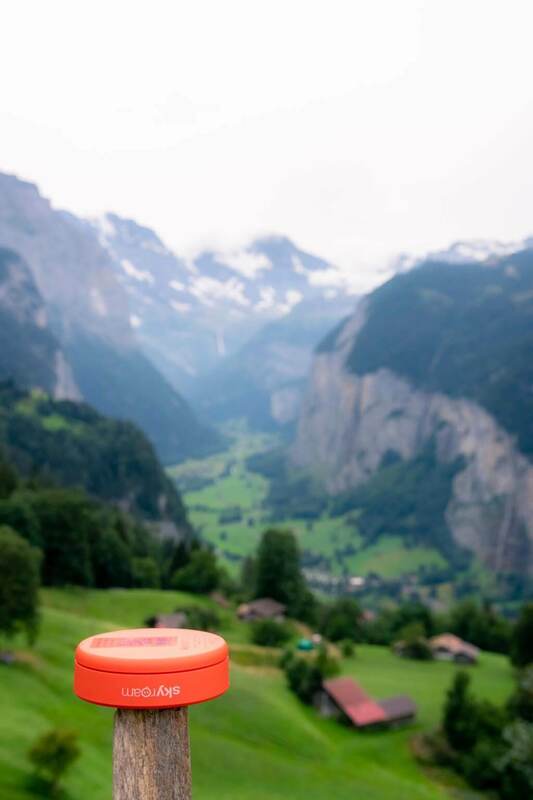 Skyroam is a WiFi Hotspot that keeps you connected in over 130 countries around the world – and also functions as a power bank if your phone runs out of charge.